Thousands of Zooper Tango double strollers are being recalled after the company received 185 reports of the latches failing, which can cause the strollers to collapse, the U.S. Consumer Product Safety Commission said. The problem latch is just about the front wheels. Two young children were hurt in one of the reported incidents after the stroller they were riding in collapsed, the CPSC said. Consumers are asked to stop using the strollers until they order and receive a free repair kit for the latch. 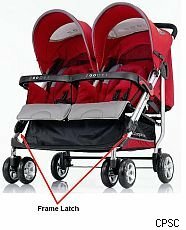 About 3,700 of the Chinese-made strollers, distributed by Lan Enterprises, were sold nationwide for $400 to $430. The recall only involves models made in 2007 and 2008. They have the model numbers SL808B and SL808F and manufacture dates from Jan. 1, 2007, until April 30, 2008. The dates can be found on warning labels affixed to the seats. Consumers who want more information and need to order the repair kit can call Zooper USA at (888) 966-7379 weekdays from noon to 8 p.m. Eastern Time or visit the company's recall site.